2169, CENTER CAP USED, 02-04, CHRY, 300M, CHROME, RAISED 300M WORD IN CENTER, PLASTIC CLIPS & WIRE RING, 2" DIA. 2395/2359, CENTER CAP USED, 11-12, 11-12, DODGE, DURANGO, 2-1/2" DIA.FOR A USED RIM, 20X8, 5 LUG, 11-12, DODGE, DURANGO, ALUM, CHROME, 5 SPOKE. RAISE IN EACH SPOKE. ORDER UNDER 2359 CENTER CAP. 3306b, CENTER CAP USED, 01, FORD, MUSTANG COBRA SVT, BLACK BACKGROUND, CHROME SVT LOGO, PLASTIC CLIPS, WIRE RING, 2-1/2" DIA. 3476c, CENTER CAP USED, 03-04, FORD, MUSTANG (COBRA SC), SPARKLE SILVER PLASTIC CAP, ETCHED BLACK SVT LOGO, 6 PLASTIC CLIPS, WIRE RING, 2-1/2" DIA. 3501c-1, CENTER CAP USED, 03-04, LINCOLN, TOWN CAR, CHROME FINISH, BLACK WORDS LINCOLN, BLACK BACKGROUND, CHROME LOGO, 6-5/8" DIA. 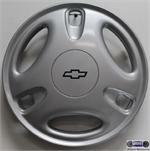 4573, CENTER CAP USED, 03-05, CADILLAC, DEVILLE, DHS, ALL CHROME PLASTIC CAP, 14 PROJECTIONS MATCH SPOKES, 8-1/2" DIA. 4573, CENTER CAP USED, 03-05, CADILLAC, DEVILLE, DHS, ALL CHROME PLASTIC CAP, 14 PROJECTIONS TO MATCH SPOKES, 5 SETS OF PLASTIC CLIPS, WIRE RING, 8-1/2" DIA. FOR A 16", CHROME 14 SPOKE RIM. 5097, HUBCAP USED, 14", 89-90, PONTIAC, BONNEVILLE, SPARKLE SILVER, 12 SLOT TYPE, CHROME OUTER RING, PAINTED DARK SILVER , 3 SETS OF 3 SLOTS, 3 SLOTS IN CENTER WITH RED LOGO, PLASTIC CLIPS, WIRE RING.